Hold on to your trowels, you’re about to hear some big news. A new vegetable — not a new variety — heads to nurseries over the next couple of weeks. A cross between brussels sprouts and kale, Petit Posy is as pretty as it is nutritional. 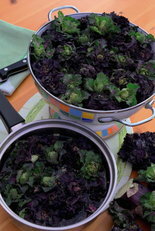 Bred in England and brought to the U.S. market exclusively by Log House Plants in Cottage Grove, the new introduction has co-owner Alice Doyle so excited she can hardly breathe: “Petit Posy is a cross between all colors of curly kale and brussels sprout! It’s hardy and is grown like brussels sprout, standing happily in the garden throughout winter. “This is truly a revolutionary ornamental edible!” Doyle finishes with unabated enthusiasm. Don’t hyperventilate. Unlike most brand-new plants, Petit Posy will be plentiful and easy to find, Doyle says. As will be the other newbies introduced to us this year by Territorial Seed, Burpee, Nichols Garden Nursery and New Dimension Seed. A vegetable so new it doesn’t really have a name. OK, it does, but one that sounds more like a new variety than a whole new edible plant. But it is. A cross between kale and brussels sprouts, it stands upright like brussels sprouts with fluffy, frilly edged, purple, green and bicolor buttons or rosettes that take after kale. The easy-to-harvest buttons have a flavor akin to spring greens and are a great source of Vitamins A, C, K, and folate; a 3-ounce serving provides half the daily requirement. Alice Doyle, owner of Log House, reveals that more varieties are in the works. Sow seeds from April to early June. 100 days to maturity from sowing. TIP: When you plant (even if you are planting in raised beds), make bowl-like depressions in the soil that are about 6 inches deep and plant one plant in the bottom of each bowl. This allows you to fill the bowl with water, which ensures that you water deeply. Irrigate only when dry, so the plant will work to search for water and grow strong, deep roots instead of lazy, close-to-the-surface roots. The plant will be more compact and healthy; too much water can create weak branching or rank growth. If you can manage, hand-watering is one of the best presents you can give your garden. Be careful to keep foliage dry, which will reduce the habitat for mold and fungus. Use a watering wand with breaker and valve for best control. For several years, ‘Superslicer’ has wowed them in their trials. Extra-robust vines give armloads of green, flattened, sweetly flavorful pods that reach 6 to 8 inches long on tall vines. Especially surprising is how tender and delicious the beans remain even when they attain mammoth proportions. This is a romano type of bean, meaning that it has flat, wide pods. The pods didn’t get tough or stringy when the bean got large, as other romano types did at the same size. 75 days to maturity from direct seeding. TIP: Beans are relatively easy to grow and prefer to be direct-sown into the garden bed when soil (not air) temperatures are above 60 degrees. Typically, they plant beans between mid-May and mid-June at their trial grounds in the southern Willamette Valley. Beans are light feeders so do not over-fertilize. Excess nitrogen can result in robust, green plants with few pods. Top dressing the row of beans with compost and a little bit of well-rotted manure is sufficient for the season. Also, to maximize the amount of yields from the plants, harvest beans on a regular basis. This will cause the plant to focus its energy on producing more flowers and consequently more beans. Fresh peas are just too good for only one crop. Enter ‘RSVPea,’ the pea that pleases two times around. The sturdy, 3 1/2-foot vines produce prolifically — not only pods, but also the copious number (seven to eight) of peas within. Very sweet and tender in both the first and second acts. A Burpee exclusive. 56 days to maturity from direct sowing. TIP: Everything begins with the hole, and what is the hole but the soil around it? Use well-rotted compost to make sure it’s nice and loose. Soak seeds in a natural inoculant such as the boosters they sell at the store; or add inoculant to soil. It’s worth every penny. With peas, you must use a trellis; the plastic mesh ones are the greatest. A happy, party name celebrates a plump, jolly carrot that has been called the sweetest ever. “It’s so delicious you just want to stand in the garden, wipe it off on your jeans and start crunching,” says Rose Marie Nichols McGee. Fortunately for us, ‘YaYa’ is tolerant of heavy clay soil. Sow in intervals from spring to late summer to get an ongoing harvest. If you plant too many of these 6-inch-long carrots, don’t worry — they’ll stay in the ground for several weeks and be as sweet and crunchy as ever. 60 days to maturity from direct sowing. TIP: Smooth soil. Then drag finger along the surface to make a groove. Put seeds in the groove, which helps to hold moisture. Cover very lightly with soil — no more than the size of the seed. Give it a light watering (don’t soak!) once a day until they germinate. It’s rare to see carrots come up before 10 days; they can easily take two weeks. The big thing with carrots is spacing. Even though it’s hard with such small seeds, try to space them about an inch apart so you don’t have to do quite so much thinning. Once they’re going, carrots are easy. 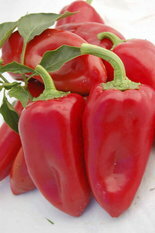 A pretty red pepper that looks like a hot pepper but is exceptionally sweet. The peppers are triangular and a long 7 to 8 inches. Unlike most bell peppers, this early pepper turns red quickly when it reaches full size. This easy-to-grow and fruitful variety has a short season for a pepper. 45-50 days to maturity after transplanting. TIP: You can harvest peppers when they’re green or wait till they turn red. A great pepper for roasting. Check out seed packets for recipes and cooking tips. In garden centers throughout the Northwest; check website for locations. Seeds are in stores everywhere and online; plants also available online. Seeds available online or in stores throughout the Northwest; check Web site for locations. Seeds available online or in stores throughout the Northwest; a few plants sold online. Seeds available in stores throughout the Northwest, see Web site for locations; plants as well as seeds sold online.